Who Are the Rehab Specialists? What About Cognitive Rehabilitation Therapy? What Kinds of Rehabilitation Should a TBI Patient Receive? Never Settle for What's "Supposed to Be"
[Amy Mansue] A rehabilitation hospital is the place that you come after you've had your acute care stay, so think about it as the surgery happens in one place, and then you need to do a long period of making sure you learn how to talk and walk and think again, and that's what the rehab component is about. You have a team of people that are around you, led by a doctor, and then a team of occupational therapists—a speech therapist, a physical therapist. We have Child Life, which is our recreation-type program. It's so important, especially in children, that they learn how to play again and learn how to make sure that they can find that joy, and then the team of nurses that are really with them the most. It's our job to be able to see the progress and put the pieces together to be able to help those children either recover what they've lost or establish a whole new set of goals for themselves as they continue in this process. Hospital Executive Amy Mansue talks about the team of nurses, doctors, rehab therapists, and Child Life specialists that helps kids with TBI recover what they've lost or establish new goals for life. See more video clips with Amy B. Mansue. Posted on BrainLine August 8, 2013. 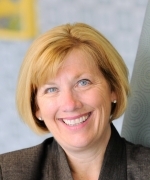 Amy Mansue is president and chief executive officer of Children's Specialized Hospital. She provides leadership to an extremely skilled team of clinicians and therapists providing specialized care for children. Produced by Sharon Ladin, Justin Rhodes, and Erica Queen, BrainLine.